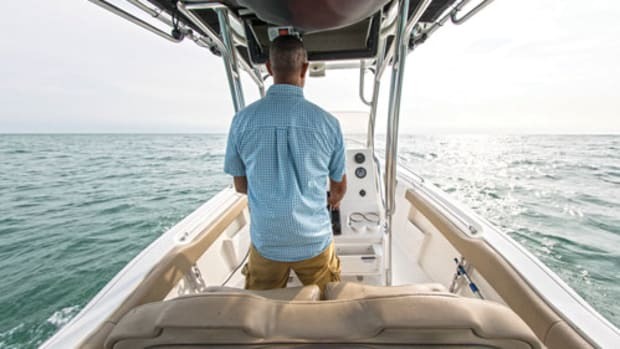 Statistical Surveys, a Michigan company that tracks new-boat registrations, provides monthly, quarterly and annual reports on boat sales from every state in the country. 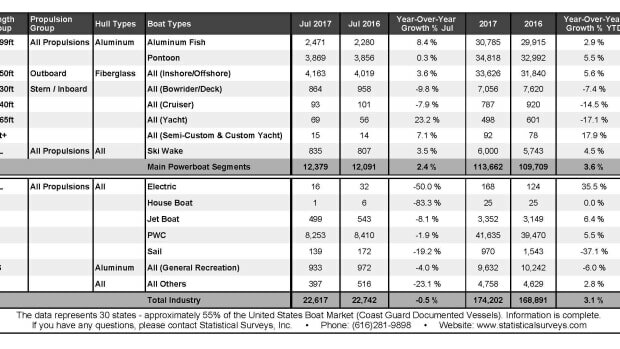 Preliminary figures show that more than 263,000 new boats were sold in 32 early-reporting states in 2017 as the recreational boating industry put even more distance between itself and the Great Recession. Hurricane Irma limited sales of new recreational boats in Florida in September and that was a key factor as the industry’s third-quarter results were flat, compared with the same period in 2016. 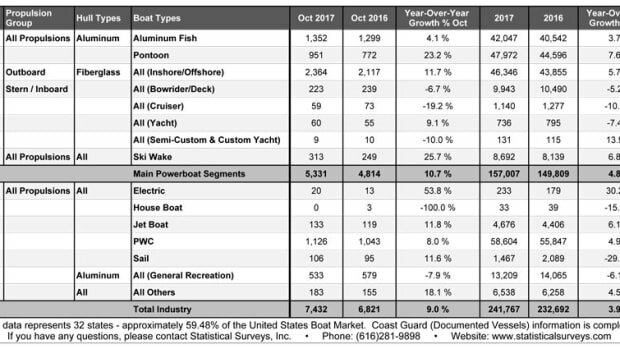 Seven of the top 10 states for recreational boat sales recorded more in October than they did in the same month last year as the industry rebounded from a hurricane-influenced September decline. 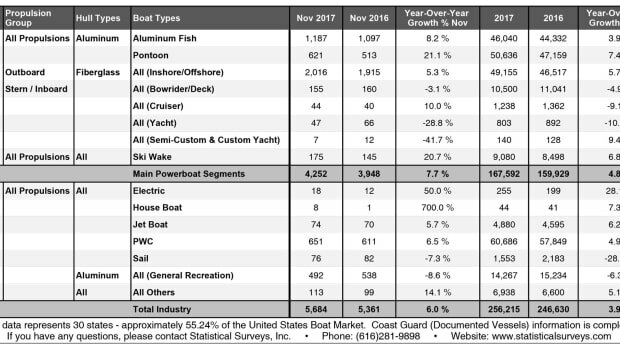 During most months Florida leads all states in new-boat sales, but Hurricane Irma made September an exception. Led by aluminum pontoon and outboard fiberglass boats, ski and wake boats and jetboats, sales of new recreational boats had their best percentage gains in three months in August. Led by aluminum pontoon boats, outboard fiberglass boats and personal watercraft, new-boat sales showed healthy second-quarter growth. 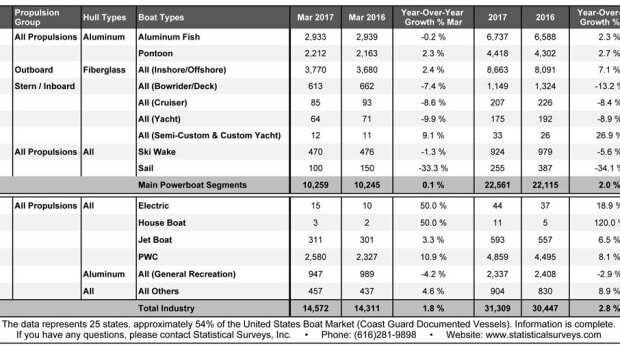 The boating industry has seen good momentum in 2017, although some say spotty weather this summer and chaos in Washington caused a bit of a slowdown in the smaller and larger boat segments and that some buyers might be getting cautious, anticipating the next economic slowdown. New fiberglass boats showed increased sales across all length groups, with the 35- to 49-foot leading the growth with a 10.5-percent increase. 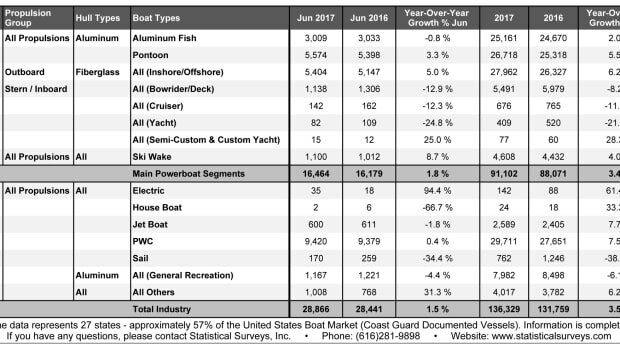 Sales of new recreational boats slipped slightly in July, marking the second month in a row of modestly rising or falling sales after a strong industry showing in May. 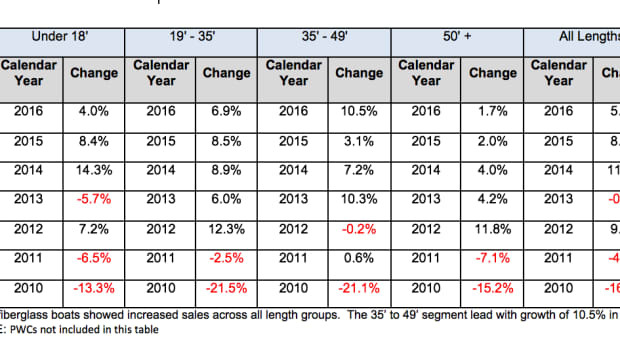 A year ago in June, sales of new recreational boats were bouncing back after falling virtually flat during April and May. 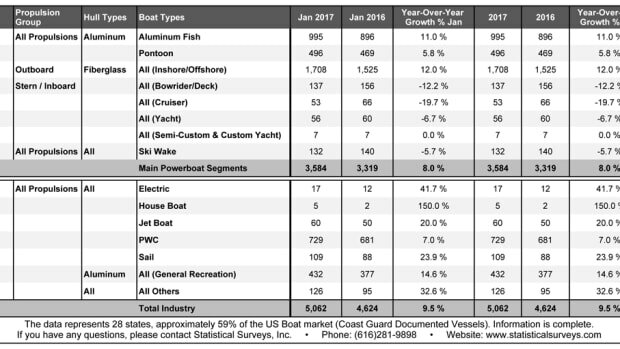 Canada saw a slight dip in used-boat sales in 2016 with 63,505 units sold last year. Recreational boat sales rose 2 percent in the first quarter, slower growth than the industry posted a year earlier. 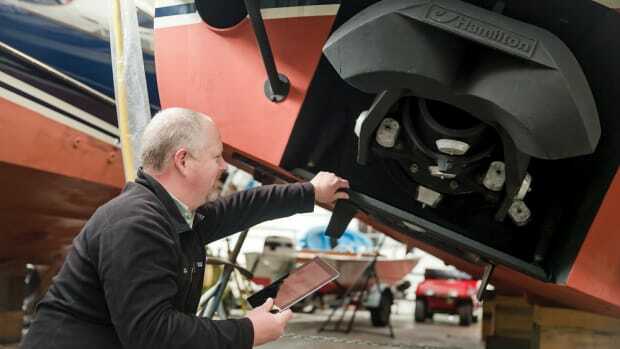 Will industry embrace used-boat certification? 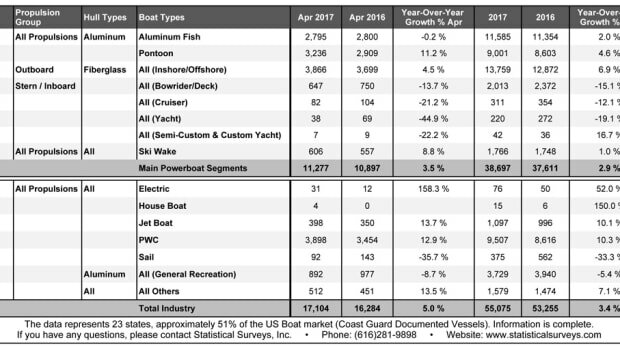 The U.S. recreational boating industry achieved moderate gains in April. 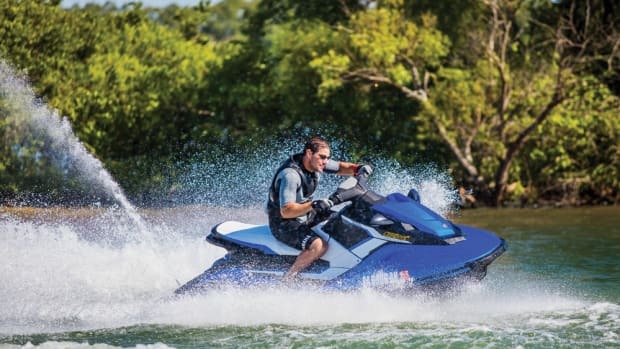 Outboard fiberglass boats were the industry’s top seller in the early-reporting states. 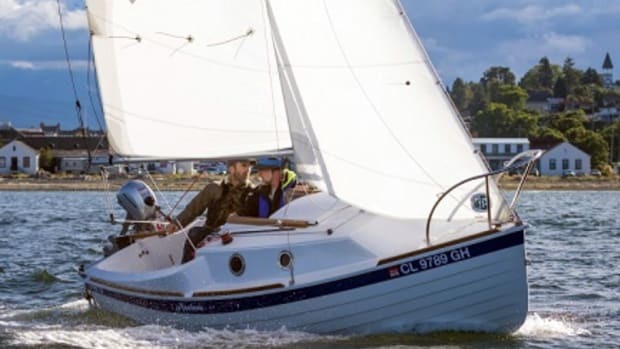 The National Marine Manufacturers Association said new sailboat retail sales totaled 6,500 units in 2016. 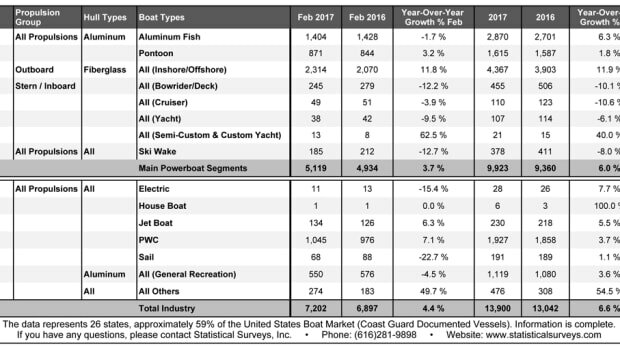 The recreational boat industry followed a strong January with moderate February growth. 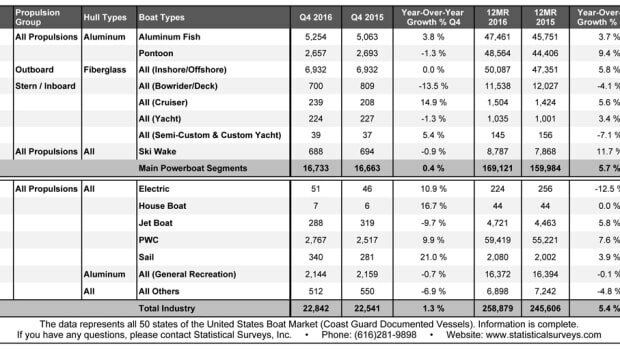 The U.S. recreational boat industry sold more than 250,000 boats in 2016 for the first time in eight years. The gains were concentrated among fiberglass outboard boats and aluminum fishing and pontoon boats.